The new Battle Back Bone has been designed to deliver maximum protection and comfort to ballers of all ages. The Battle Back Bone absorbs impact and provides reliable protection to your back region. 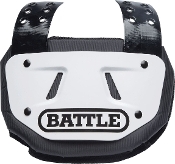 Compared to flat back plates, the unique design of Battle’s curve plate disperses impact and is much more comfortable to wear. Strong attachment straps to keep the backplate close to your back. Floppy backplates don't help when you get hit. Blindside hits can be painful; get your game right.